Every student here at Morgan has a particular interest and goal in life. “School and our community want to expose students to a variety of careers to help them explore and find personal areas of interest. We are interested in helping guide student course selection at Morgan and after, and career choices and trends,” said PTA representative Laura Colebank. Each student at The Morgan School will rotate through three one hour presentations that will give the students time to listen and ask questions of the presenters. 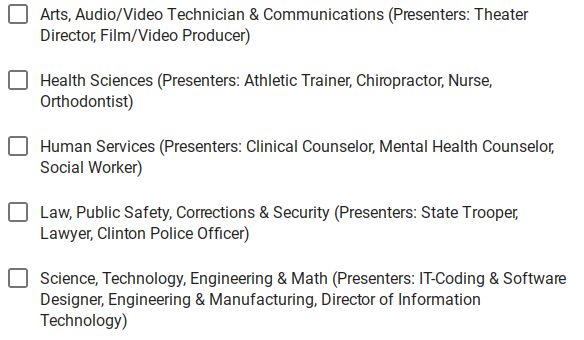 Each of the five career clusters (listed above) will have three representatives. For Business majors, there will be a few representatives. Students interested in business can attend sessions on manufacturing, IT, or network security. The PTA and The Morgan School personnel decided which careers would come to Morgan based on student interest. Since there are some students who don’t plan on going to college after high school, a big concern about career day among students was if there will be any careers that don’t require a college diploma or additional education after high school. The answer is probably. There might be careers within these clusters that do not require education beyond a high school degree, but it is up to the student to ask the representative for that information. Morgan is also planning a whole different event to cover options for students who are not planning to go to college.